Clip-ins may be growing in popularity because they are relatively inexpensive, easy to use at home and don’t require a long-term commitment. Real hair is sewn onto a small wig clip to make a clip-in extension. They’re available in a variety of lengths and colors – including fun shades like pink. Clip-ins should be taken out at the end of the day and won’t damage your natural hair any more than a barrette or similar hair accessory. You can find clip-in extensions online and at beauty supply stores. Like clip-in extensions, tape-ins are easy to use and remove when compared to other types. Hair is stuck to a strip of adhesive tape to make a tape-in extension. The tape is then adhered directly to your natural hair, letting the extension and your real hair sandwich together. To remove them, apply a spray that dissolves the adhesive. Tape-ins are great for adding volume. They can be reused and will last up to two months. Micro-link extensions are also called micro-bead or micro-tube extensions. They’re applied by threading links (or beads or tubes) into your hair, threading the extensions through the links and then flattening them to hold the hairs together. Part of the appeal of micro-links is that no heat or glue is used to apply them. However, the links can sometimes be difficult to open, causing damage to your natural hair when it’s time to take them out. Micro-links aren’t recommended for thin or fine hair. Bonded extensions are sometimes called strand-by-strand extensions. Strands or sections of hair are bonded directly to your natural hair with a hot keratin- or latex-based glue. Bonded extensions are one of the most secure type of extensions and they can add a great deal of volume and length where it’s needed. Bonded extensions are also good for adding high or low lights to natural hair. They are a big commitment; it can take several hours to apply a full set of bonded extension, but they last for up to four months. Bonded extension can cause extreme damage to the hair if removed incorrectly, and these extensions should be applied in a salon. Sewn extensions are also called weaves. Weaves can cover the full head or just add volume where it’s needed. The advantages of sewn extensions is that they last for a very long time – up to five months – and they are the most secure type of extension. The disadvantages are that they are literally sewn onto your own hair and be quite heavy. 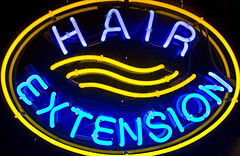 They also require the most maintenance of any extension. You don’t have to spend a fortune to have great-looking hair extensions. Try your hand at clip-ins and begin experimenting with different styles. If you make a mistake, you can easily start over!